Mary L. Dudziak teaches legal history and constitutional law at Emory University School of Law. Her work sets American history in a global context. Cold War Civil Rights explores the relationship between civil rights and foreign relations during a time when American race discrimination undermined U.S. prestige around the world. 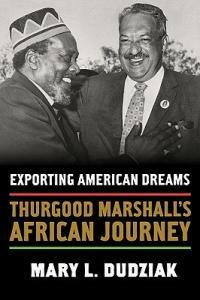 Exporting Dreams tells the story of Thurgood Marshall's work with Kenya's emerging leaders as they sought independence in the early 1960s. Dudziak's newest book, War Time: An Idea, Its History, Its Consequences, examines ideas about time that are embedded in the way we think about war, helping to explain why we persist in thinking that war is temporary when American military engagement seems to have no end point.